What problems might young kids solve in their communities? Real world problems are often right in our backyard and schoolyard. Given the opportunity to investigate their rural Wyoming community, Big Horn 3rd graders discovered that local residents were not recycling, then chose to research and improve recycling efforts. Through this project, the students were empowered to recognize their role in the community and ultimately realized the importance of stewardship for the county's land, history and culture. Challenged to find ways to make A Better Community, these 32 third graders chose to investigate recycling in the Big Horn, Wyoming community. They started by creating a survey and issuing it to students and teachers on the campus. They compiled the information collected from the surveys and created graphs to determine if there was a need for recycling on the Big Horn campus. 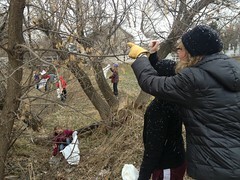 Moving out to the community, students organized a trash clean-up around Big Horn, then used this trash as additional research data points: sorting it into different types of recyclable materials, then graphing the results to determine the biggest pollutant, the most commonly littered items around the school and community, making note of which items could have been recycled. 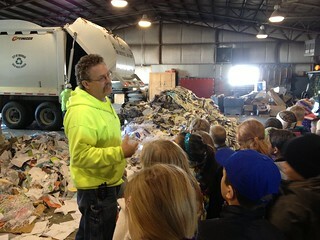 Research continued with a visit to the local Landfill and Recycling Center, where students inquired about how they could start a recycling program at Big Horn Elementary. Following that visit, students developed a proposal for a school-wide recycling program and interviewed the principals at Big Horn Elementary and Big Horn High School to address their concerns and determine if they would be able to create a recycling program. Based on a positive response from the principals, the third graders are currently in the process of implementing their plan to help the community through recycling at their school. Many teachers fear large projects due to the need to stay on sequence and cover required standards. Those teachers who take the plunge, however, often find they are able to cover more requirements and do so in a way that addresses students passions. Projects like Laurie’s provide natural opportunities for the rigor demanded by the Common Core. Because the issue of recycling was concretely rooted in their personal and school-lives, opportunities for reading and writing across many subject areas were abundant. As students sought to understand these problems, they analyzed informational text and summarized their findings in writing, speech, and mathematically. As a result, Laurie was able to address an impressive range of Common Core ELA standards, math standards, and her state science and social studies content standards- all while giving her students the opportunity to make a real impact in their school and community. 3rd Grade Specific Math Content Standards | This small sampling demonstrates the specific math content connected to the Mathematical Practice Standards. CCSS.Math.Content.3.NBT.A.1 Use place value understanding to round whole numbers to the nearest 10 or 100. WEEK 1 | Phase- Make it Real: Brainstorm. In small groups, students brainstormed ideas that would make a positive impact on the county. As they came back together as a whole group, they shared their wide range of ideas: ruling out impossible ones, narrowing down to a specific idea that the class could take on, then identifying one with strong student support: recycling. After choosing the issue of the community’s recycling habits, students were challenged to determine whether there was a recycling problem, and if so, what was the need in the community. Students began by visiting the county recycling website and reviewing a professional survey on the county’s recycling habits. Students used the results of this research study to determine what the needs might be and to start a discussion on how improved recycling could help their local environment. WEEK 2 | Phase- Make it Real: Investigate and Define. Goal: Determine need at the most local level: the school campus. Activity: Create a recycling habits survey to distribute to the students and teachers. To further this research, the students decided to create a survey focused on recycling. During the survey building stage students recognized the importance of convenience, and were most concerned that the general public did not have any idea of where recycling bins were located in the county. Several felt that a county map should be constructed that reflected this information. 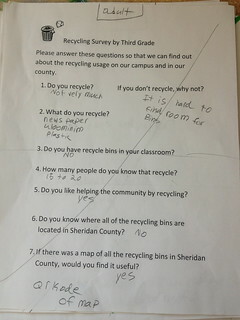 Students conducted their survey, including questions about the county recycling bins, throughout the elementary and middle schools, questioning students and adults. They then translated this data to a tally graph. After sorting through the questions, students worked in pairs preparing bar and circle graphs on excel to determine if there was a need for recycling on the Big Horn campus. 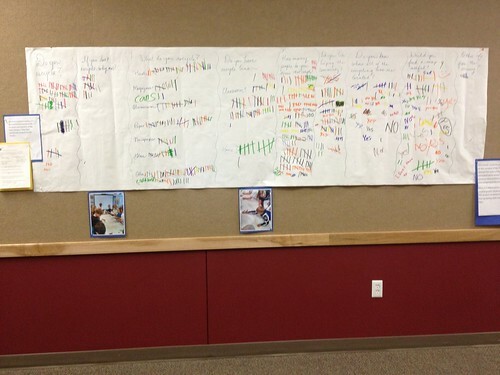 Student survey and the tallied results displayed in the school hallway. Goal: Conduct hands-on research in the community using a variety of methods. Activity: Conduct a community trash pickup, then analyze the results to determine recycling needs. 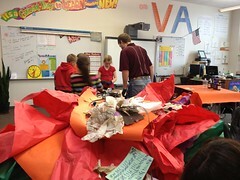 Activity: Create trash art using collected trash items. The next step was to get out into the field. 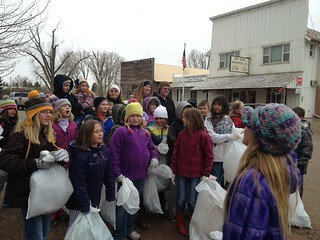 Students began the week by embarking on a city-wide trash pick. The goal was not just to clean up the trash, but to use each piece as evidence of a larger problem, and data points for analysis. After collecting the trash, students separated it by recyclable categories: paper, plastic, aluminum, and others (clothing was a commonly found item). 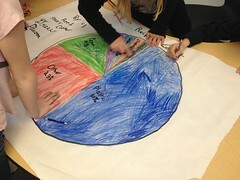 They counted each piece then created graphs to represent their findings: plastic was the most common trash item. 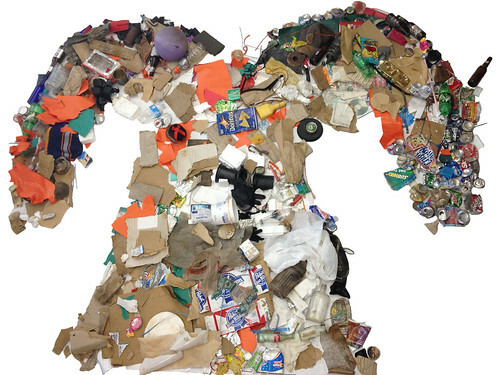 Students created a piece of trash art in the shape of a ram’s head, then displayed it in the school hallway to inform people about the amount of recyclable trash they found in the community. Trash pick-up in downtown Big Horn, WY. Sorting trash into categories. In the background you can see a PollEverywhere exhibiting student predictions about which type of trash they’d find the most of. A trash collage of the school's mascot, the Big Horn Ram. Watch a stop-motion animation of the making of the Trash Ram. Goal: Conduct hands-on research in the community, analyze the results in order to develop an action-plan. 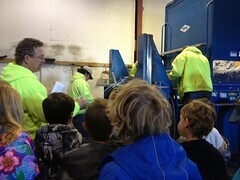 Next, students visited their local recycling facility to learn more about the process and talk to the most important experts on their topic: waste management employees. Students asked them for tips on how they might implement a recycling program in their school. What would they need to keep in mind? How might they do it? 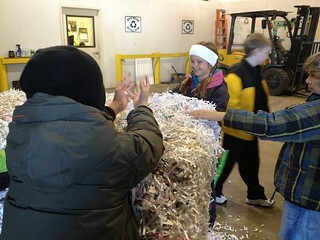 Students visit the Sheridan County Recycling Center and Landfill. 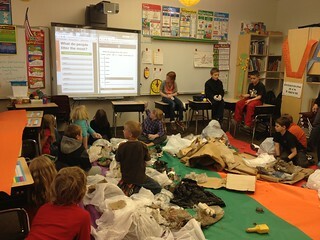 Activity: Propose a school-wide recycling program to key stakeholders, then advocate with with larger school community. They then interviewed Principals at the Elementary and High School to see if a recycling program at their school would be possible. Students organized to create recycling bins out of cardboard boxes. In the spirit of reusing materials, they painted them with leftover house paint from their homes. They also came up with a schedule/plan for emptying the classroom bins into the recycling container. In order to inform and engage the rest of the school community, students designed posters to advertise the recycling initiative and posted them around the elementary, middle school, and high school campus. Then, students created a system to support school-wide recycling. In the spirit of reusing materials, they painted boxes that they dug out of the school’s cardboard trailer and brought in unfinished cans of paint from home to paint the boxes. The boxes were distributed to classrooms across the Big Horn campus, and students began the process of collecting recyclables, working with the custodial staff and classroom teachers to ensure successful implementation. Video of Student Implementation by local newspaper The Sheridan Press. Aside from meeting a wide range of Common Core and local standards, this project had a real impact on the participating students and the surrounding community. Emotional intelligences | In order to be successful in this process, student had to think beyond their own personal needs to consider the needs of the larger community and the local environment. Ability to Collaborate Effectively | Collaboration went well beyond the classroom and included working with peers, students across all grade levels, adults, and a variety of local experts. Recycling Campaign | Informed the school community about importance of recycling and developed systems to improve recycling options. Students also reported increased recycling and reusing of materials at home. School Wide Recycling Program | Implemented a school-wide recycling program that involved all students, other teachers, school principals, school custodians, and the county recycling center. Student-Driven: Making the project student-driven allowed multiple opportunities for students of all skill levels and interests to participate and be part of the process. Ongoing Opportunities for Collaboration & Peer Feedback: Laurie & Lamont felt that having continuous opportunities for students to work in collaborative groups was one of the most beneficial outcomes of our year-long project. They became very adept at collaborating and evaluating each other's work. Student Choice: Offering several different choices in the final product provided structure, but also allowed them to "drive" their learning and have control in the final presentation. Emphasis on Student Action: The recycling project was the end result of a larger year-long project exploring the Then & Now of Sheridan County, Wyoming. Having the students take action by implementing their recycling idea was really key to bringing their study of the then and now of Sheridan County history full circle. They were very invested in making a difference for the now and the future of the county and are fired up about continuing with the recycling efforts next fall. Allow time for meeting with County Commissioners: Structure the time a bit differently so that students have an opportunity to visit with the county commissioners in order to bring official recycling bins to the school site. In this iteration of the project there was not time, but teachers Laurie and Lamont plan to have their students take this on next fall. Get wider school involvement: Involving other classes in the recycling project would have made this more meaningful to the larger school community. When Laurie and Lamont saw the impact this project had on their students and families, they realized that it would have been an even richer experience if it had impacted the whole school in a personal manner. Get support from key stakeholders: Definitely have the support of the administration and the board. Find outside experts to provide support, if possible: Laurie and Lamont collaborated with the Pearson Foundation’s Model Classroom Program, and found this helpful in providing ideas on integrating digital media as well as another perspective to look at the project from a different angle. Teachers trying this project might look to their local school community to see if a media specialist could assist, or might look to the local college or university for collaboration and outside perspectives. Make it intentionally interdisciplinary: Although this project was incredibly interdisciplinary, Laurie and Lamont feel they could have blended the project into the core curriculum areas a bit more and a bit earlier in order to allow for deeper learning and to cover more subject areas. The Model Classroom was a three-year program of the New Learning Institute, sponsored by the Pearson Foundation.